The jobs and profits connection: Does it exist? This somewhat new line of thinking seems to ignore the observation that productivity gains have allowed businesses to increase sales without adding workers. In addition, with millions still out of work, companies face little pressure to raise salaries. 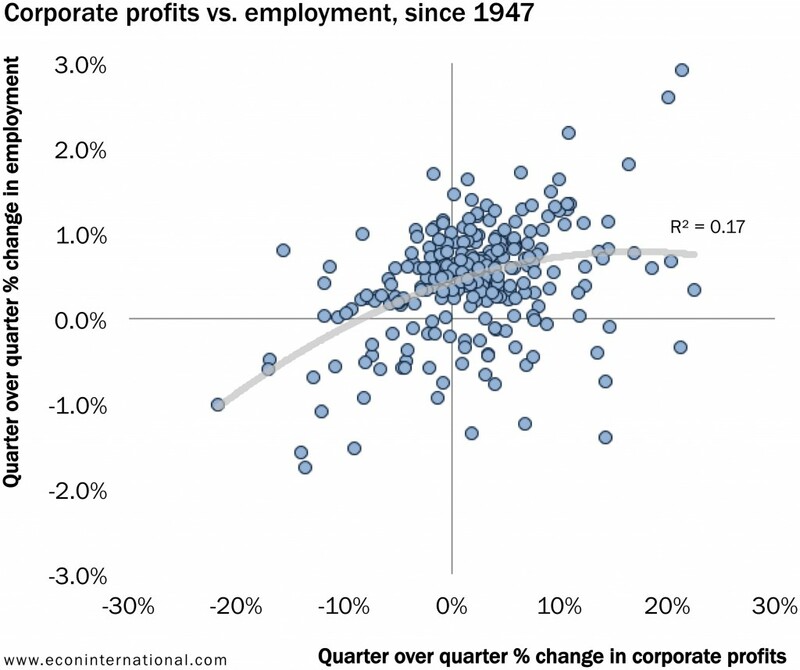 First, let’s take a look at the long run relationship between corporate profits and employment. 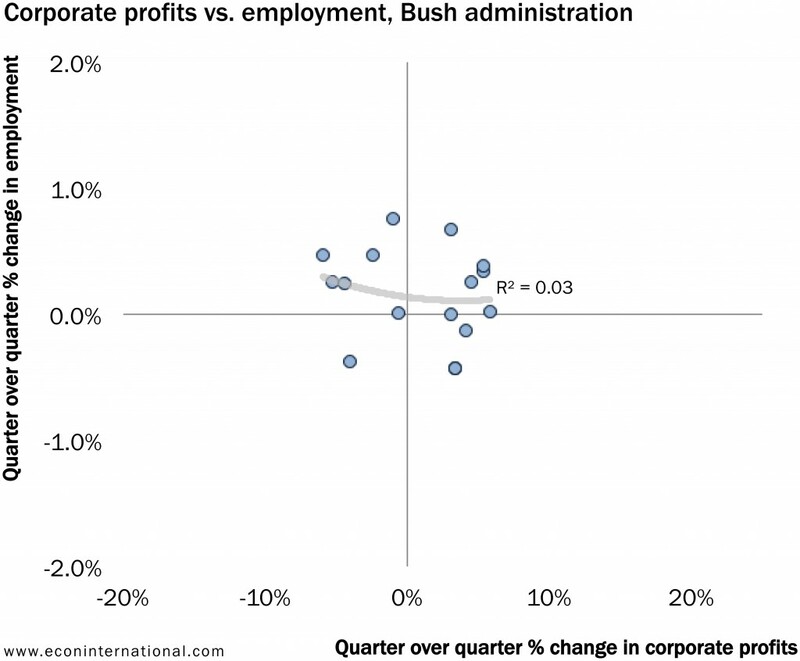 The figure below shows the quarter-over-quarter change in corporate profits against the quarter-over-quarter change in U.S. employment. Casual observation supports the association between corporate profits and company hiring: Generally speaking an increase in profits is associated with increases in hiring and decreases in profits are associated with reduced hiring or layoffs. Casual observation also shows that the relationship is not very strong. 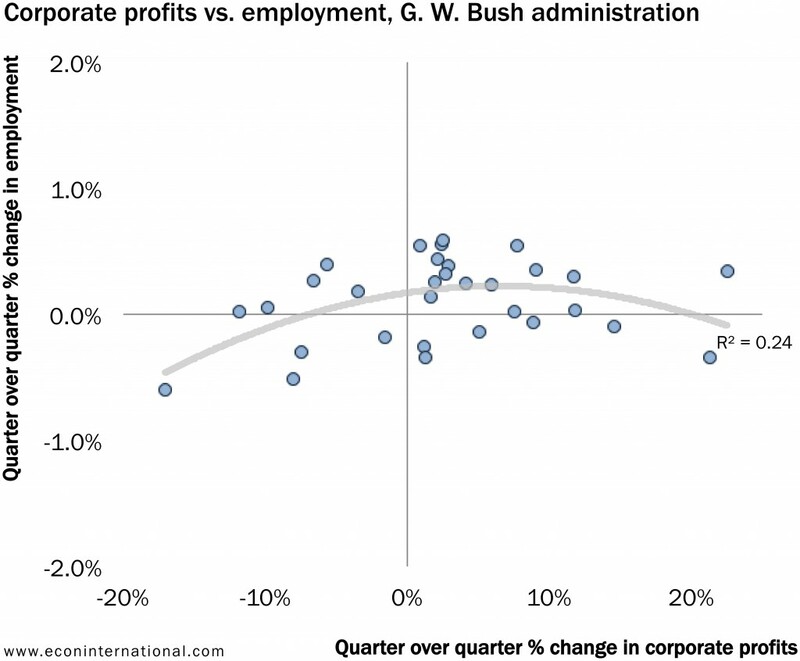 Looking more recently, the graph below shows that since the beginning of the Reagan administration to the present, there really has been no relationship between corporate profits and employment. So what gives? Is Galston living in the post-World War II boom years where employment boomed and corporate profits rolled in? 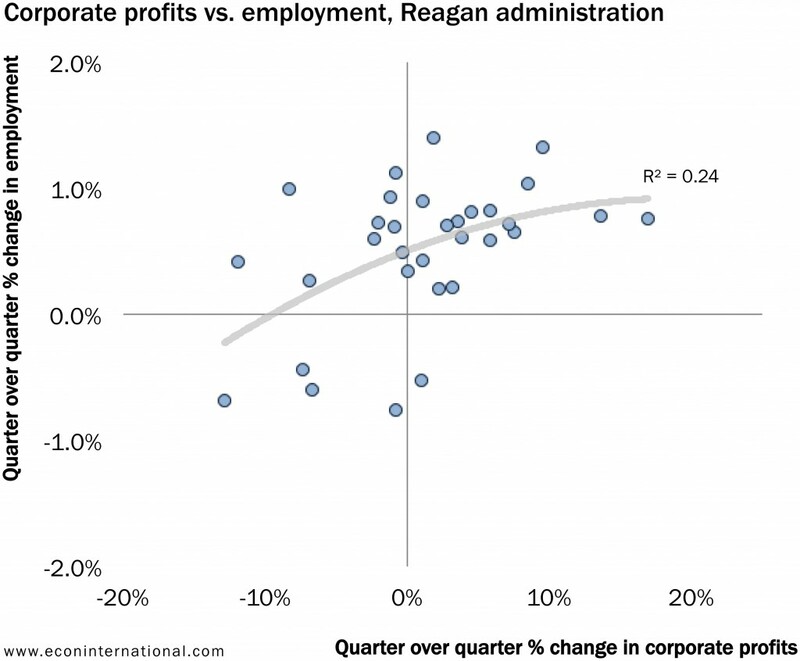 The figure below shows that the Reagan administration should be Exhibit A as an example of soaring profits coexisting with strong employment growth. George H. W. Bush oversaw the recession that sent me to grad school. His administration was marked by small profits and a languid job market, and no real relationship between the two factors. 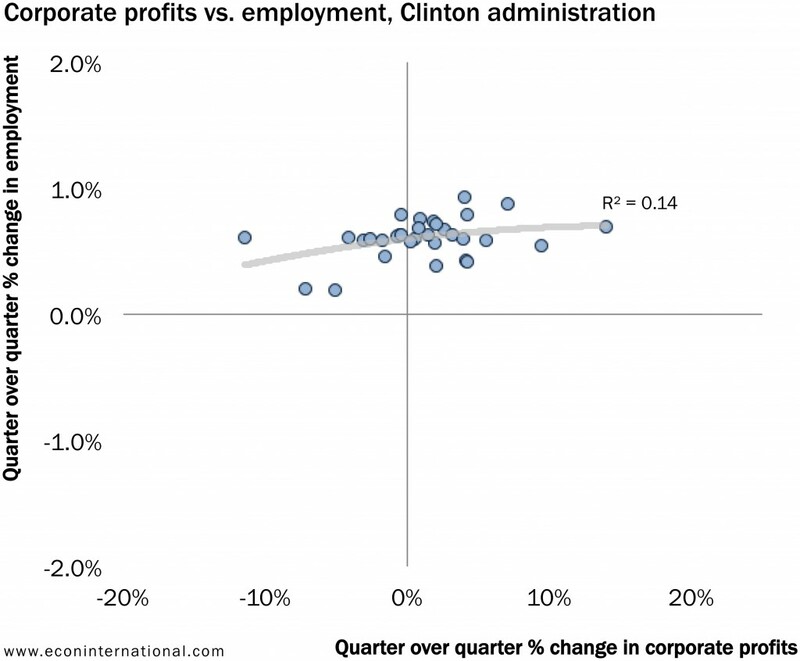 While the booming economy during the Clinton administration saw strong employment growth and decent corporate profits, there wasn’t really much of a relationship between the two: A 14 percent increase in corporate profits was associated with the same employment growth as an 11 percent decrease in corporate profits. Now things get interesting … And we get a peek at why Galston and others are wringing their hands so hard. That makes the “Greed is Good” of the Reagan administration look not so greedy after all. The Obama trend line seems to be driven by the four quarters with employment declines that occurred at the beginning of his administration (the red dots). If we take out those observations, we see that we return to the modern phenomenon of no real relationship between corporate profits and employment. 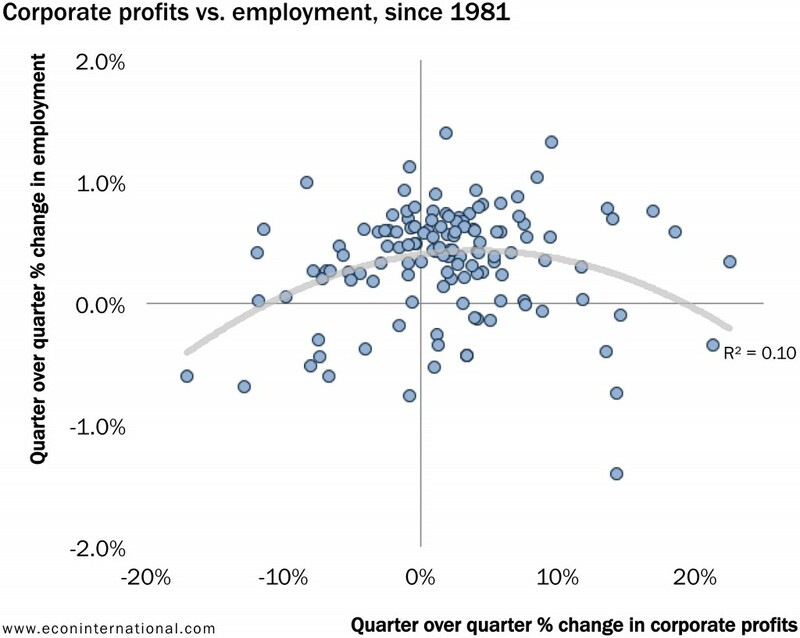 Over the quarter century there has been no relationship between corporate profits and employment. 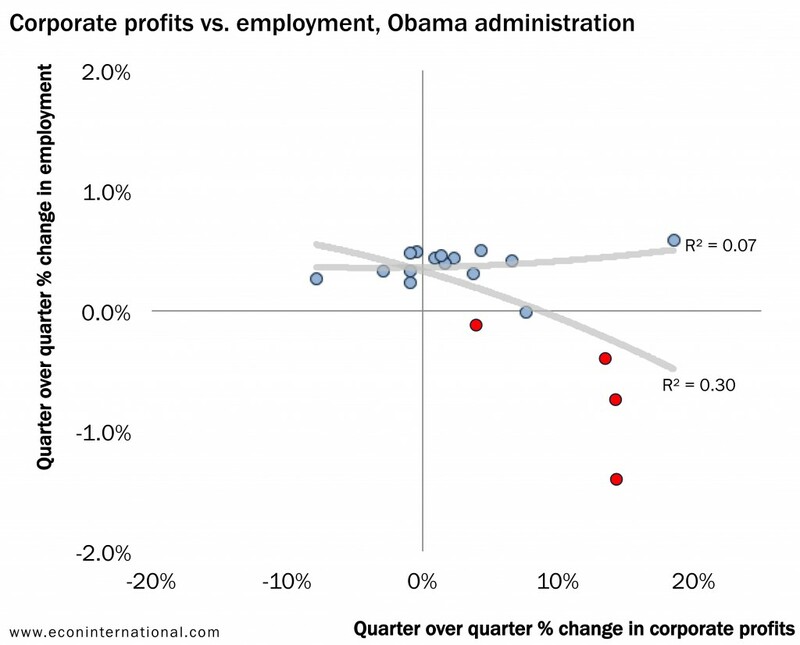 The line of thinking that argues that corporate profits should be spent to boost hiring seems to have been pulled out of thin air (or at least out of the first five quarters of the Obama administration). Perhaps our energies would be better spent on figuring out ways to boost profits and employment simultaneous would be a more productive effort.